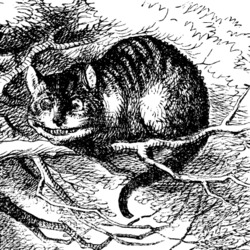 As you no doubt remember from Alice in Wonderland, the Cheshire Cat keeps disappearing. Indeed, the cat’s habit of disappearing at will presents an insurmountable challenge to the Queen’s normally simple rules on executions. When [Alice] got back to the Cheshire Cat, she was surprised to find quite a large crowd collected round it: there was a dispute going on between the executioner, the King, and the Queen, who were all talking at once, while all the rest were quite silent, and looked very uncomfortable. And the executioner went off like an arrow. The Cat’s head began fading away the moment he was gone, and, by the time he had come back with the Duchess, it had entirely disappeared; so the King and the executioner ran wildly up and down looking for it, while the rest of the party went back to the game. While Judge Colleen McMahon’s reference to Alice was probably just an offhand reference, I submit that she’s got a Cheshire Cat right in the middle of her ruling: CIA General Counsel Stephen Preston and the Gloves Come Off Memorandum of Notification. As you read her ruling, it’s helpful to remember that she has seen some materials that plaintiffs ACLU and NYT have not. Moreover, this ruling was not sufficient to her argument. She has also written a classified Appendix. This opinion will deal only with matters than have been disclosed on the public record. The Government has submitted material to the Court ex parte and for in camera review. Certain issues requiring discussion in order to make this opinion complete relate to this classified material. That discussion is the subject of a separate, classified Appendix to this opinion, which is being filed under seal and is not available to Plaintiff’s counsel. As a threshold matter, then, it is perhaps judicious to assume that any big holes in McMahon’s ruling are dealt with, by necessity, in that Appendix. This court has reviewed these explanations and concludes that the searches by the responding agencies comported with their statutory obligations. Again, I’m biased, having pointed out all sorts of reasons why the searches were inadequate, but for McMahon to conclude they were, there must be more compelling evidence in that classified declaration, and she should have to explain how those facially inadequate searches were adequate. But consider her treatment of a different document I’ve found missing in the past: Preston’s very public speech obliquely covering targeted killing. McMahon acknowledges (page 20) that the plaintiffs have included that in their list of public statements Obama officials have made about targeted killing, but she doesn’t give it the detailed treatment she gives several other speeches by John Brennan, Harold Koh, President Obama, Jeh Johnson, and Eric Holder. I find that significant given that Preston laid out different logic for the legality of targeted killing than the others did, situating it in Article II rather than in the AUMF. Preston checks off the first box–authorization under US law before the op–by looking to Article II, not the AUMF Congress passed. First, we would confirm that the contemplated activity is authorized by the President in the exercise of his powers under Article II of the U.S. Constitution, for example, the President’s responsibility as Chief Executive and Commander-in-Chief to protect the country from an imminent threat of violent attack. This would not be just a one-time check for legal authority at the outset. Our hypothetical program would be engineered so as to ensure that, through careful review and senior-level decision-making, each individual action is linked to the imminent threat justification. That’s interesting for several reasons. First, it situates the authority to use lethal force not in the stated basis OLC is using–the one SCOTUS has affirmed (sort of), but in Article II. Just where John Yoo would look to situate it. This also means that CIA maintains it has this authority–presuming a Presidential Finding–outside the context of a declared war. The memo described by Charlie Savage, like all the other speeches, relies on the AUMF. Mr. Awlaki, who was born in New Mexico, was also accused of playing a role in a failed plot to bomb two cargo planes last year, part of a pattern of activities that counterterrorism officials have said showed that he had evolved from merely being a propagandist — in sermons justifying violence by Muslims against the United States — to playing an operational role in Al Qaeda in the Arabian Peninsula’s continuing efforts to carry out terrorist attacks. Other assertions about Mr. Awlaki included that he was a leader of the group, which had become a “cobelligerent” with Al Qaeda, and he was pushing it to focus on trying to attack the United States again. The lawyers were also told that capturing him alive among hostile armed allies might not be feasible if and when he were located. Based on those premises, the Justice Department concluded that Mr. Awlaki was covered by the authorization to use military force against Al Qaeda that Congress enacted shortly after the terrorist attacks of Sept. 11, 2001 — meaning that he was a lawful target in the armed conflict unless some other legal prohibition trumped that authority. Preston’s speech suggests that if OLC were writing a memo authorizing the CIA to kill Awlaki–as distinct from a memo authorizing DOD to kill him–it wouldn’t necessarily situate the authority in the AUMF. And from that we can surmise that DOJ might have an entirely different memo for CIA than for DOD, with the one described by Savage being the DOD one. I’ve suspected that’s the case for quite some time (I’ll try to rewrite the 2 very long unpublished posts laying this out). But I suspect it even more so now. About 30 pages of McMahon’s opinion addresses why DOD can withhold OLC opinions it has acknowledged. As part of that discussion, she asserts the NYT only wants the DOD opinion. The Times sole apparent goal at this point is to get a hold of the OLC-DoD Memo, which, it assumes, contains the final legal analysis and justification it seeks. The ruling doesn’t note this, but I think NYT is doing more than assume here. Savage suggested, after all, that the memo he described was the memo that governed the killing of Awlaki. But the document that laid out the administration’s justification — a roughly 50-page memorandum by the Justice Department’s Office of Legal Counsel, completed around June 2010 — was described on the condition of anonymity by people who have read it. So I assume he was told that the memo described to him was the memo that governed the killing a full 15 months later, at a time when CIA had taken over the lead in drone killings in Yemen from DOD. But there is no suggestion, in any of those speeches or interviews, that the legal reasoning being discussed is the reasoning set out in the OLC-DoD Memo, a document which the Government acknowledges exists. This document, unlike the OLC opinions on local enforcement of immigration laws, has never been mentioned in any public statement. For that matter, OLC has never been mentioned in any public statement; none of the speeches attribute any legal principles announced to OLC or to any opinion it has issued. Indeed, she even quotes from a colleague’s opinion raising the possibility of other memos addressing the same topic. McMahon makes extra sure to identify the DOD memo at issue when she notes that plaintiffs are speculating when they assume the DOD memo–the DOD memo addressed to Eric Holder–is the one that governed the actual killing. That may be so, but it is sheer speculation that this particular OLC memorandum–addressed to the Attorney General “pertaining to the Department of Defense” and “regarding a potential military operation in a foreign country”–contains the legal analysis that justifies the Executive Branch’s conclusion that it is legal in certain circumstances to target suspected terrorists, including United States citizens, for killing away from a “hot” field of battle. “Mere speculation will not suffice” to support a conclusion that a particular document has been adopted as official agency policy., and aside from speculation, there is no indication that the OLC-DoD Memo is the [sic] “the only document comprehensively laying out the [Government’s] legal authority” with respect to targeted killing operations. She even makes it clear that other memos relevant to the topic might be covered under the No Number No List responses, or even the CIA Glomar. Plaintiffs so argue because this Memorandum is the only document containing legal analysis and opinions whose existence has been disclosed to them. But as chronicled at the beginning of this opinion, various agencies have filed No Number, No List Responses to both FOIA requests, and the CIA has asserted a Glomar response to the requests from teh two Times reporters (which seek only legal opinions). As a result, it is impossible even to know whether any other legal opinions aside from the OLC-DoD Memo exist, let alone whether senior Administration officials were actually relying, in whole or in part, on some other opinion or opinions that might (or might not) exist when they made their public statements. And she later goes onto remind, for the third time, that CIA has issued a Glomar with respect to any opinions, even helpfully noting that the only thing left within CIA’s Glomar declaration is legal opinions. The CIA has persisted in its initial Glomar response with respect to the Shane and Savage requests (even though they were not addressed to the CIA), supserseding it only to the limited extent of disclosing that it has no legal opinions in its files concerning its participation in the operation that killed Osama Bin Laden. By contrast, the CIA decided that it “can confirm the existence of records responsive to ACLU’s request without harming national security” although it refuses to confirm or deny the existence of any records that would also be responsive to the Shane and Savage requests–that is to say, legal opinions. That damned Cheshire cat, disappearing entirely just as the executioner prepares to behead him. Finally, there’s one more reason I think Stephen Preston and his agency are grinning madly through McMahon’s ruling. McMahon cites Alvin Hellerstein’s opinion in the ACLU torture FOIA. That, of course, does not render the legal analysis disclosable. The reference, as it appears, is odd for several reasons. Hellerstein’s argument is the opposite McMahon takes, that a legal memo can be protected. But she doesn’t refute it here, which makes the reference seemingly gratuitous, even weakening her case. Moreover, she gives the Torture Memo FOIA a nickname, suggesting she will refer to it again. But I don’t think she does in the entire rest of the unclassified opinion (and note, she doesn’t really give the Day Laborers opinion a nickname, even though she refers to it extensively). That strongly suggests the Torture FOIA is discussed extensively in the classified Appendix. But remember how that case worked out. Judge Hellerstein, of his own accord, tried to force the government to release a few word phrase showing that George Tenet had referenced the September 17, 2011 Gloves Come Off Memorandum of Notification (the one signed the day before the AUMF, and therefore not limited by it) as the basis for the torture program. When Hellerstein did that, the Administration totally flipped out, going to the very unusual trouble of getting then National Security Advisor Jim Jones involved in the FOIA response. And the Administration stalled this targeted killing suit even as the torture one worked out (see this too). Until finally, the 2nd Circuit ruled that the government could hide any reference to that Gloves Come Off MON in a FOIA response, in part because the program it described was still active. That–along with the fact that McMahon rather bizarrely cites primarily District Court judgments, but not Circuit ones–might be a good reason to discuss the Torture FOIA case, and that 2nd Circuit Opinion, substantially in a classified Appendix, particularly if what authorized the Awlaki killing was not an OLC memo written for DOD, but instead a MON written much earlier for CIA, one that (as they did with torture) may be blessed by OLC opinions written at another time, but does not rely on them in the least. If you forget that significant parts of McMahon’s opinion are hidden like a Cheshire cat, there are big gaping holes in her logic. But once you remember that Cheshire cat is there, willfully disappearing when convenient, then it all seems to make sense. Sorry, my brain went off the rails near the top, at “which is being filed under seal and IS NOT AVAILABLE TO PLAINTIFF’S COUNSEL.” Without a legitimate Article III proceeding, all of this is game-playing by cretins deluding themselves that they’re part of a law-based state. And the Judiciary and Congress go along. While this shouldn’t be amazing by this point, it is. We’re still in an opium dream. Rime of the Ancient Mariner, comes to mind, as Coleridge would see it. The albatross is dead, and we killed it. Doom. the damage president obama, attny gen eric holder, and numerous white house “advisors” (read tutors to a profoundly inexperienced president) have done in ratifying the anti-constitutional bush legacy is not just “enormous” ( once again), but incalculable. to turn this militarily powerful nation into a brutal scourge of its citizens and of the other nations of the world. Since emptywheel is catching the semaphores of Judge McMahon and it seems AUMF is not being relied on but rather an Executive Branch MON possibly, doesn’t this get back to Mary’s comment about absolute injunctions against Bills of Attainder? Why couldn’t the judge publicly denounce such an illegal back alley? “If the [sic, ‘they’] can justify based on laws of war – then do that, but the AUMF doesn’t cover Awlaki with AQAP in Yemen who enters the fray pretty damn late. So the “due process” argument that the US PResident can issues kill orders for US citizens that it suspects of wrongdoing because rendition and extradition are too hard in some foreign countries is bull. It’s why we have a constitutional prohibition on bills of attainder – there are always situations where operating judicially is “hard” but the Executive branch and the Executive branch and Legislative branch combined are prohibited from sidestepping the judicial process to enact pains, penalties and punishments an suspected wrongdoers. That’s a prohibition on the power, period. Not a recognition that the power springs from emptiness anyplace where extradition and rendition are “hard.” Some rights are situationally compromised – but the ability of the Executive to subject a citizen to death isn’t. There’s a constitutional prohibition – an express statement that the power does not exist in the Executive or in the Executive and the Legislature combined. argh. Someone could try to have created some kind of way to wrap the judicial branch into the proces to get around that prohibition, but they haven’t. Maybe it would be even creepier if they had. that is one fine argument you and mary have put together for TODAY – right now! I’m more than happy to trot them out if I can remember them and find them. Thank you. You found the words for which I struggled. were this to happen it would not be because of some politically super-talented boogieman. – the nsa (national security admin) now authorized by congress to spy on the communi ations of americannin the u.s.
– the u.s. supreme court and appellate courts which have indicated they have nonintentions of challenging presidential or congressional assertions of a national security “need”. no doubt there are others you could add. the important point for me is that these institutions have been created and then have been authorized to engage in activities which could, under malevolent leadership, be used to rapidly impose severe restrictions on political liberties and to incarcerate leaders of an opposition. what is really missing from this commentary is an acknowledgment of this really brilliant essay by ew. this post is not just your usual clever two-line reference to something carroll wrote in aiw that seems apropos to the concern of the moment. it is a carefully worked out analogy to a part of that story as it relates to judge macmahon’s ddecision, with special emphasis on lewis carroll’s interest in logic (and in time) in “alice in wonderland”. in my view, ew has done a bravura writing performance in reporting on this matter. Great detective work and analysis, EW! IMO, one major reason the 9/17 MON cannot see the light of day is that it would be quite clear this was not a document that could have been drawn up in 6 days, i.e., in the time available since 9/11 occurred. If that were true, it presents a kind of Northwoods scenario. Judge Invokes Alice in Wonderland in Denying NYT and ACLU Targeted Killing ... Why Not Have a Hearing on Civilian Drone Casualties?